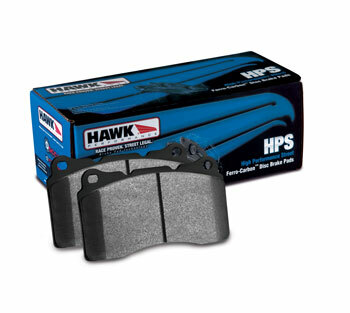 High Performance Street disc brake pads are legendary for increasing stopping power on street-legal vehicles. Increasing the performance of your vehicle’s braking system is easy when you choose Hawk Performance’s HPS braking compound. ers a higher coecient of friction over stock brake pads and can provide you 20-40% more stopping power and higher resistance to brake fade than most standard replacement pads. Less fade means you will have better pedal feel and more consistent performance in a durable brake pad that generates less brake dust. These are for Factory based applications. Please call or email our sales team if you require special fitment on aftermarket calipers. Not all Applications are available for front and rear locations.